Drawing the Line is a pop-up gallery exhibiting artworks created by students who have participated in abuse prevention and respectful relationships programs delivered in schools partnered by the Desert Blue Connect Community Education Team. The exhibition will display the artworks that convey key messages which reinforce that violence is NEVER ok and we all have the right to feel safe and be treated with respect. The artworks aim to raise awareness in the community about these messages and to give the students a voice in which to express their thoughts about what they’ve learnt throughout the programs. The exhibition will feature artworks from secondary students including Geraldton Secondary College, John Willcock College, Geraldton Grammar School, Morawa Agricultural College and Nagle Catholic College. The content within these programs cover a range of issues around gendered violence, abuse prevention and building relationships that reflect equality and respect. Safe use of technology, managing jealousy, gender stereotypes, various forms of abuse and how to recognise when a line has been crossed are also included as topics in the programs. 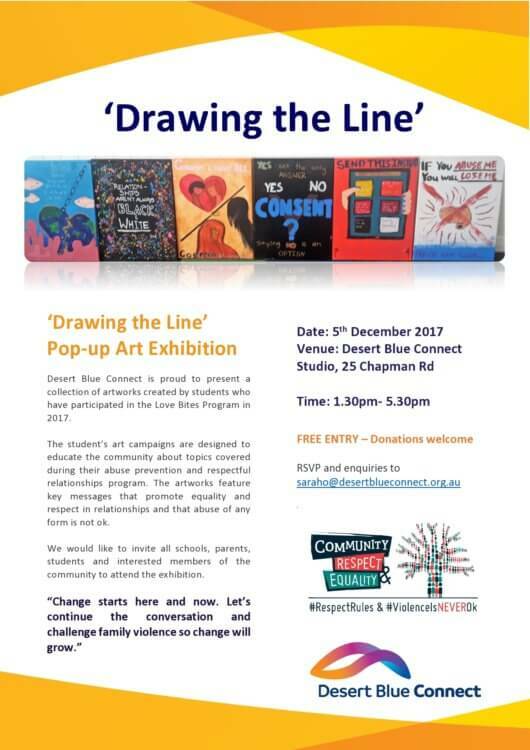 Drawing the Line is open to the public, with the target audience being students, teachers, family members and anyone in the community interested in supporting the students to promote their key messages. The Pop-up Art Gallery runs from 130pm to 530pm on Tuesday 5th December 2017 in the Desert Blue Studio, 28 Durlacher Street, Geraldton. Entry is free.